Haphazard. This is often the approach that businesses take to marketing, where they are easily side-tracked by fleeting, quick wins. CEOs wouldn’t have this cavalier attitude to any other long-term investment plan, so why treat marketing this way? When it comes to your investments you have a clear goal, whether it’s to save for your child’s varsity fund or to help you retire at 55 to travel the world. This is the approach you need to take with your marketing. As a business you want to grow, but how serious are you about investing in this growth? Treat your marketing like you would any other investment; have a specific framework, a set of quantifiable performance indicators and, crucially, a sound marketing strategy that includes what you want to achieve, who you’re targeting and how you’re going to measure your plan’s performance. You wouldn’t put all your financial eggs in one basket and neither should you with your marketing. If you focus on one marketing channel you could achieve some short-term wins, but you could just as rapidly find yourself in trouble. Digital technology and marketing methods have a habit of changing quickly, leaving you behind if you don’t diversify your plan to best reach your market. To have a stable and successful marketing presence, you need to diversify and make use of a variety of marketing channels, campaigns or initiatives, and top it off with a few big ideas. When you’re a year into a long-term investment, you don’t anticipate a big return. Why then, would you expect that from your marketing investment? To reach your long-term marketing goals you want to avoid high-risk efforts and rather focus on steadily growing awareness and sales, and then work to improve ROI. Your strategy will set the course, and the measurement and tracking of your campaigns will soon give you a good idea of the successful of your brand building, engagement and lead generation efforts. 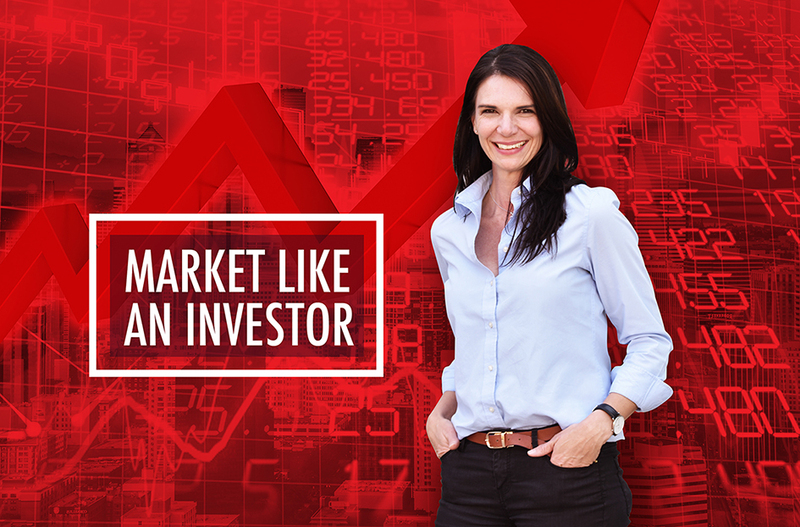 When you invest money on the stock market, you follow the results to see how your investment is performing. In the same way you need to track your various marketing campaigns, so you know where your marketing resources are going and precisely what you’re getting out of them. For example, if you can identify where your website visitors come from, in addition to how traffic source is converting on your website, this allows you to make quick, agile changes to your campaign. The impact this has, is better overall results. Has your golf partner shared a potentially lucrative bit of information with you? Or perhaps it was your neighbour or your uncle? You don’t make an investment simply based on a hot tip, you invest because there’s a good reason for doing so. The same should go for your marketing. Just because you listen to a certain radio station or your teenage daughter loves Instagram, it doesn’t necessarily mean these are the best channels to reach your target audience. Be informed, so you can make the best marketing decisions for your business. Want to get more mileage out of your marketing spend? You need an agency that will put strategy first and focus on multi-channel campaigns to help you get more marketing bang for your buck.